The Eden team is extremely pleased to announce that a full token release is going to take place on December 5th, 2018 (PST). We realize it has been a turbulent time in the crypto space and EdenChain, together with its valued community, have not been spared. Despite the challenges, there has been tremendous progress in developing the EdenChain technology. 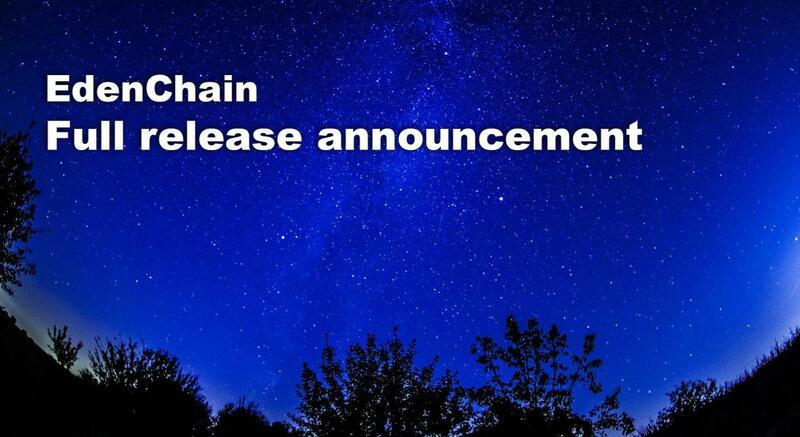 We would like to share our enthusiasm, excitement and optimism for the future without the distraction of a token release plan that, although made in good faith as something that would be beneficial, is no longer in the best interest of EdenChain and its token holders. In addition, we believe that in order to enable our desired expansion into western markets, making our tokens broadly available for use on our existing platform is important. Accordingly, we have decided that a full release of tokens is the most prudent course of action for making our token available for use. We remain focused on creating ‘The Engine Behind the Most Dynamic Enterprise Blockchain Infrastructure’. Through that platform, we hope all of its participants will be able to share the fruits of our labor with current and future token holders and enterprises.It is our sincere hope that by fully releasing the tokens we will be able to move forward and, together with the community, strive for this objective and achieve the long-term vision of Eden. Please note: This token release does not apply to the lockup applicable to the Eden team; those tokens will still be locked until September 2019.